An extraction-spectrophotometric technique has been applied and approved for the estimation of orphenadrine citrate in the presence of paracetamol in a binary synthetic mixture and in combined drugs. The procedure is built on the formation of a soluble red colour orphenadrine citrate – eriochrom black T (EBT) ion pair complex at pH 1.40, while the paractamol not paired. The produced red colour ion-pair complex was extracted with chloroform and showed maximum absorption at 509 nm. For quantitative evaluation Beer’s law applied to plot the absorbance against concentration, the relation was a linear in the concentration range of 0.10-6.00 µg/ mL with the molar absorptivity 4.4025 x104 L / mol. cm. The limit of detection and limit quantification were 0.024 µg/ mL, and 0.100 µg/ mL respectively. The intra-assay precision evaluated in terms of % relative standard deviation (RSD) (< 2%). And accuracy was validated with % recovery (98.8-102.5%). The results showed that orphenadrine citrate could be determined successfully in the combined tablet without interference by paracetamol and other common co-formulated substance. Orphinadrine citrate --- Paracetamol --- Ion-pair complex --- and Eriochrome black T.
Tigris river --- power plant --- water index. The present study was used 20 adult male rats that distributed to four groups (each group consist 5 rats); control group that administrated normal saline, rats group that exposure to X ray for two weeks, rats group that exposure to X ray with 50ug of green silver nanoparticles for two weeks, rats group that exposure to X ray with 100ug of green silver nanoparticles for two weeks. The results show high significant increased (P < 0.01) in levels of malonedialdehyied (MDA), and high significant decreased (P < 0.01) in levels glutathione (GSH) and significant increased (P < 0.01) in levels of Alanine Aminotransferase (ALT), Aspartate Aminotransferase (AST), Alkaline Phosphatase (ALP), compared with control group. Histological section of liver sections that prepared from rats group that exposure to X ray show lymphocytes infiltration, thickening wall and congestion of central veins. when used green silver nanoparticles with X ray, the results showed non-significant changes (P < 0.01) in all parameters compared with control group. It was concluded that green silver nanoparticles has been potential role against the negative effects of X ray in adult male rats. green silver nanoparticles; X-ray; liver functions. Natural radioactivity --- granite --- high purity germanium detectors --- hazard indices. Toxoplasma gondii is an opportunistic pathogen in which the reactivation of a latent infection can cause death in congenitally infected fetuses, newborns, and immunocompromised patients. This study aimed to determine the seropositivity of toxoplasmosis infection and the possible association with Interleukin-12 (IL-12) and Interleukin-23 (IL-23) cytokines in breast cancer patients. In this study, 190 women were enrolled. All serum samples were tested for T. gondii immunoglobulins (IgG and IgM) antibodies and (IL-12, IL-23) levels using ELISA technique. The result of this study showed that breast cancer patients recorded the highest percentage of toxoplasmosis infection. There were no positivity rates for anti- Toxoplasma IgM in breast cancer patients while the positivity percentage for anti- Toxoplasma IgM among the control group was (7.00%). Furthermore, the seroprevalence of anti- Toxoplasma IgG was the highest in the age group (31- 40) years in patients with breast cancer while the highest mean titer of the IL-12 is restricted to ages (21-30) years in the control groups who are seropositive to anti- Toxoplasma IgG. Although, in patients with breast cancer who are seropositive to anti- Toxoplasma IgG, the highest mean titer of the IL-23 was in ages (21-30) years. Since most immunosuppressive patients are exposed to various possible risk factors including Toxoplasma primary infection or reactivation, so it is important to diagnose and treat toxoplasmosis in breast cancer patients to reduce the consequences of the infection. leishmaniasis is a disease of global concern, Leishmania types and distribution rates vary from country to another. For visceral leishmaniasis serum samples were examined by the kala-azar dipstick rapid test. Meanwhile smears were taken from lesions, air dried, fixed and Leishman stained then microscopically examined for amstigote stage in cutaneous leishmaniasis. From April 2014 to April 2015, 150 samples for cutaneous leishmaniasis (CL) and 108 serum sample for visceral leishmaniasis (VL) from in and out patients in Pediatric, Azadi Teaching and Kirkuk General Hospitals were examined. The incidence of visceral leishmaniasis was very low (2.7%) comparing to that in cutaneous leishmaniasis (64.6%). No significant differences had appeared between the cutaneous leishmaniasis incidence in male or female. The most age group infected with cutaneous leishmaniasis in both genders was 5 ≤ years old, with rate of 26.1% in male and a rate of 15.8% in female. Significantly high frequency of the patients were presented with only one or two lesions with rate of 39.17, 25.7 % for each type of lesions respectively. The most location that infected with CL was hand (27.7%) and high rate of them being moist type (71.13%). In Kirkuk city CL is more prevalent than VL. High rate of CL is moist type locating in the limbs and face. The infection is more frequent in children than in adult. For CL a smear taken from the lesion is much worthy than a lesion blood sample or re aspirated saline injected to the lesion. Leishmaniasis --- Epidemiology --- Kirkuk city. Because of Citrobacter freundii medical and economical importance and that there are only little local studies about it, this study aimed to isolate and identify this important bacterial species from others that have a similar biochemical and morphological characteristics. Twenty five chicken meat samples were collected randomly from local markets in Baghdad city during 2017; Citrobacter was isolated from the collected samples using selective and differential media and identified using biochemical tests, the identification was confirmed using Vitek 2 compact and polymerase chain reaction for 16S rRNA and the isolated bacteria identified as C. freundii. Citrobacter --- Chicken --- 16S rRNA --- Sequencing. The resistance of Staphylococcus aureus to ciprofloxacin has complicated the problem of treating staphylococcal associated infections in which MRSA is the causative agent since ciprofloxacin was the drug of choice to treat such infections. Our study investigated the incidence of Ciprofloxacin resistant S. aureus isolates that were also methicillin resistant among Iraqi patients. The obtained bacterial isolates were tested for Ciprofloxacin resistance using agar dilution method and the sequence of gyrA and parC. The results revealed that about 8% of the isolated MRSA strains were Ciprofloxacin resistant and the resistance was due to mutation in gyrA rather than parC. Biological experiment was performed (with Complete Random Design (CRD)) by using sterile and non-sterile soil, to investigate Rhizobium leguminosarum isolate ability to enhance fava beans (Vicia faba) plant. The experiment includes: control group (C), fertilizer treatment as group 1 (F), and Rhizobium leguminosarum inoculum treatments as group 2 (R). Fava beans seeds were planted in pots filled with 5 Kg soil (sterile and non-sterile), and after seven weeks of germination, length and weight of plant vegetative part and plant root were measured. The ability of Rhizobium leguminosarum isolate to produce hydrolytic enzymes (chitinase, pectinase, protease, and lipase) was studied. The results show that the isolate was able to produce chitinase, pectinase, protease, and lipase enzymes. Furthermore, the addition of Rhizobium leguminosarum inoculum to fava beans plant increased the length and dry weight of plant vegetative part (20.3% and 51.5% respectively) and also increased the length and dry weight of plant root (49.28% and 56.2% respectively) as compared with control group. Rhizobium leguminosarum --- hydrolytic enzyme --- fava beans --- (Vicia faba) --- biofertilizer. In the present study, the effect of vasicine alkaloid separated from Adhatoda vasica as an inhibitor agent on the activity of proteases enzyme isolated from Pseudomonas aeruginosa was investigated. 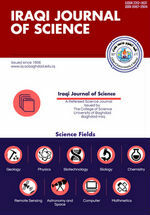 forty isolates of Pseudomonas aeruginosa were collected from local hospital in Baghdad and then their ability for producing proteases was screened using quantification and semi- quantitative methods. Pseudomonas aeruginosa P1 was selected as the highest protease producer, which next identified as P. aeruginosa. It was found that the optimum culture conditions for protease production in submerged culture was in the tryptic - soya broth medium at 37° C with pH 8 for 48 hours. In addition, the study involved extraction and partial purification of vacisine alkaloid from crude leaves of Adhatoda vasica by separation and precipitation that was 0.6% of vasicine The results revealed a significant effect of the extracted vasicine on the activity of protease enzyme as its activity was decreased from 15.5U / ml to 1.2 U/ml when treated with vasicine at a concentration of 0.8ml with an inhibitory effect of 92.2%. vasicine --- A. vasica --- Protease --- P. aeruginosa --- inhibitory activity. The aim of the study was the examination of the effect of birth control pills (Yasmin) on women who utilized the pills by measuring the percentage of apoptosis. The investigation was based mainly on the calculation of the apoptosis percentage of blood lymphocytes in women who used the pills for different durations. The results of the presented study was obtained from 25 women handling birth control pills and 15 women who had not used pills. According to the period of contraceptive pills treatment, the samples were classified into two categories: (2-5) years and (6-8) years. Results showed that the percentage of apoptosis in pills handling women (2-5) years were (7.08%) while the results were (12.2%) in women who used birth control pills (6-8) years. In addition, the results values were significantly different (P≤0.05) from those in control, which were (0.18%). Based on the results obtained in this study, it is concluded from that the percentage of apoptosis increase with the prolonged use of Yasmin. In this work, has been a studied the effect of thermal treatment using different annealing temperatures (373, 423 and 473) K in vacuum on structural and morphological properties of organic semiconductor Alq3:C60 thin films which are prepared by the spin coating on a glass, silicon and porous silicon. These films have been coated on substrates with speed of 2000 rpm. The structure properties of Tris(8-hydroxyquinoline) aluminum (III) (Alq3) and fullerene (C60) (100:1) and (100:10) blend as-deposited and treated have been studied by X-ray diffraction (XRD) for glass only and morphological properties by Atomic Force Microscope (AFM) for silicon and porous silicon substrates. The results of XRD pattern shows that the structure of (Alq3:C60) as-deposited and annealed thin films are polycrystalline in nature for both mixed weight ratio. The result of AFM measurements show that grain size increase is due to the increases of surface energy at high temperature. Surface roughness increasing and decreased randomly with the temperature can be attributed to the random distributions of the grains and also due to the phase change. An integrated seismic sequence stratigraphy and facies analysis has been carried out with a view to understanding the depositional environment and stratal stacking pattern of Nandy Field of Niger Delta. Well logs and biostratigraphic information were used to identify the lithologies, stratal stacking patterns, stratigraphic surfaces, system tracts and reservoir potentials of the field. Seismic sequence stratigraphy and seismic reflection patterns were used to identify the seismic facies. Facies-related attributes were employed to identify the continuity and amplitude of seismic events. Three seismic facies packages and three reservoir sands were identified. The environments of deposition of the area consist of marginal marine to continental depositional settings predominantly made of shoreface deposits with few channel sands. The depositional model of the area shows that the deposition went down the axis of fluvial depositional system, which transports sediments through channels down to the shelf into the base of the slope down the basin. The seismic reflection patterns in this field are parallel to divergent reflections, high-continuity and high-amplitude facies, low-amplitude facies, low-continuity and variable-amplitude reflections, chaotic reflections and wavy reflection patterns. The seismic stratigraphic analysis of this field revealed the presence of low stand system tract (LST), high stand system tract (HST) and transgressive system tract (TST). Sands 1 and 2 were delineated within high stand systems tract (HST) while sand 3 was within low stand systems tract (LST). The results of this study show that the Nandy Field was of high hydrocarbon potentials and highlight the importance of using seismic reflection parameters (reflection configuration, amplitude, frequency and continuity) in the division and classification of seismic facies. Urban Samarra City is characterized by high population density and wide variation in land use, has led to many environmental problems, for this purpose the environmental assessment became an urgent need for surface and ground water at study area. Three water samples from Tigris River and six groundwater samples were collected and analyzed for heavy metals as Fe, Mn, Zn, Cd, Cu, Co ,Pb, Ni, Cr, As, Mo, Hg, Al, Li, Be, Se, V, U, Sr. Most heavy metal concentrations have shown higher level than standards, such as Fe, Mn, Cd, Pb, Ni, Cr, As, Mo, Hg, Al ,Li ,Be, Se, V, that might be due to anthropogenic activities such as agricultural and the heavy use of fertilizers, besides other activities among them industrial . All water samples have higher concentration level of Uranium except (SW1, SW2, SW3, GW1) might be due to military activity. On the other hand all samples were polluted in Co except SW2, GW4, high value of Co may be caused by industrial processes and oil product spills. Physical and chemical properties values which have obtained in this study are pH, EC, TDS, TSS, DO, BOD,COD and turbidity. Water analyses reveal unacceptable values for physical and chemical parameters according to WHO standard and IQS2009 limits for drinking water, BOD, EC have shown high values in all surface and groundwater samples. Whereas, high values of TDS, COD and turbidity only in ground water samples. The water is not drinkable according to Water Quality Index (WQI) all values are above 100 and, in the sequence (GW1>GW5>GW4>GW3>GW6>GW2), the water quality index of surface water (SW3>SW2>SW1). Mixing of the shallow groundwater and Tigris River water show various patterns affected by other factors such as the aquifer recharge and evaporation, especially at the shallowest parts. Heavy metal --- Drinking water --- Water pollution --- Samarra City. The main aims of this research is to find the stabilizer groups of a cubic curves over a finite field of order 5, studying the properties of their groups and then constructing the arcs of degree 2 which are embedding in a cubic curves of even size which are considering as the arcs of degree 3. Also drawing all these arcs. Stabilizer groups --- arcs --- cubic curves . In this work, we are concerned with how to find an explicit approximate solution (AS) for the telegraph equation of space-fractional order (TESFO) using Sumudu transform method (STM). In this method, the space-fractional order derivatives are defined in the Caputo idea. The Sumudu method (SM) is established to be reliable and accurate. Three examples are discussed to check the applicability and the simplicity of this method. Finally, the Numerical results are tabulated and displayed graphically whenever possible to make comparisons between the AS and exact solution (ES). Fractional calculus; Caputo derivative; Sumudu transforms; Telegraph equation. Cuneiform symbols recognition represents a complicated task in pattern recognition and image analysis as a result of problems that related to cuneiform symbols like distortion and unwanted objects that associated with applying Binrizetion process like spots and writing lines. This paper aims to present new proposed algorithms to solve these problems for reaching uniform results about cuneiform symbols recognition that related to (select appropriate Binerized method, erased writing lines and spots) based on statistical Skewness measure, image morphology and distance transform concepts. The experiment results show that our proposed algorithms have excellent result and can be adopted as a preprocessing technique.